Facebook-owned WhatsApp introduced several new features in 2018 that made the chat platform a force to reckon with in India. WhatsApp has over 22 crore users and India is currently the biggest market globally for the chat app. It is, therefore, no wonder that WhatsApp is trying hard to bring new features every few months. From group video, voice calling and Picture-in-Picture (PiP) to Stickers, forwarding restrictions and labelled forwarded messages, WhatsApp is doing everything to stay ahead in the Indian market. The year 2019 is expected to be no different, and we could see a lot of new features unveiled this year too. 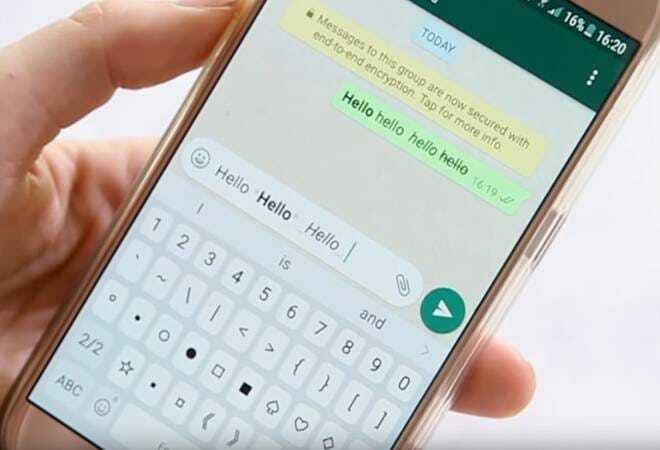 WhatsApp Fingerprint Lock feature: Facebook-owned messaging platform, WhatsApp, is working on a fingerprint locking mechanism for Android phones. The new authorisation method will make third party locking apps, which were very popular, redundant. The fingerprint authentication mechanism will add an extra layer of security as WhatsApp users will have to authenticate themselves every time they open the app. WhatsApp to redesign audio picker: Sending multiple audio files will get simpler as WhatsApp is working to improve the Audio Picker , a section for sharing audio files. The new section will have the ability to add as many as 30 audio files at once. Users will also be able to preview the audio files before sending them to their contacts. The redesigned audio files section is a part of the WhatsApp beta for Android version 2.19.1. However, the new feature is currently disabled by default and would only be enabled sometime in future. WhatsApp sticker integration: WhatsApp stickers are extremely popular in India. However, the WhatsApp sticker options are very limited at the moment. To change this, WhatsApp is now testing an update for stickers with third-party keyboard integration to offer more choices of stickers for the WhatsApp users. The first keyboard app that uses the Stickers Integration feature is going to be GBoard. According to the Wabetainfo, post the Stickers Integration feature (and the GBoard beta update made available on January, 15) any GBoard Static Sticker sent in WhatsApp will be automatically converted from GBoard to a compatible sticker format which is webp. Dark Mode for WhatsApp: This year will also see the introduction of ‘Dark Mode ‘ in WhatsApp. The rumours for this feature have been doing rounds for long. WABetaInfo has now confirmed the news saying the feature is under-development and will be unveiled in 2019. 3D Touch to check WhatsApp status: This would be an iphone exclusive feature that will allow Apple iPhone users to check their WhatsApp status with iPhone’s 3D touch without sending a read receipt message to the person whose story you were secretly looking at.